The Champion's Challenge involves receiving duel offers from species champions after you have killed a certain amount of a species. This cannot be an easy task though. Many high level people spend time trying to get champions scrolls, but it can take a long time to get one. Please be aware though - if you die against a champion you will lose your armour and weapons. The species are in the opponents section below. If you have finally received a champions scroll, congratulations! To get to the battle arena where you shall fight your opponent you must go somewhere that has been neglected for years - the Champions Guild! Inside the guild, head to the back of the room and open the trapdoor. It will bring you into a large room. Use your scroll with Doorman Larxus. He will begin the fight when you enter the door. Depending on what species you got the scroll from, you will need to fight their champion. The Champions are as follows. His rule is no use of special attacks. He is level 14. His rule is magic attacks only. He is level 24. His rule is ranged attacks only. He is level 40. His rule is no magic attacks are allowed. He is level 51. His rule is melee attacks only. He is level 56. His rule is no melee attacks. He is level 56. His rule is weapons only, no items. He is level 85. His rule is no prayers. He is level 102. His rule is no ranged attacks. He is level 107. His rule is no weapons or armour! He is level 162! 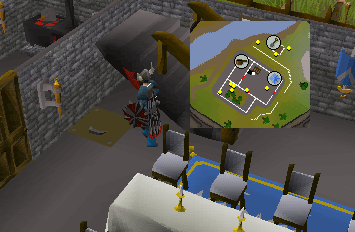 Tip: Although you can't bring weapons or armor, you can use Prayer and bring runes to attack him. After defeating the champion of the species, speak to Larxus. 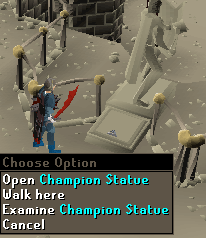 You will have to face the champion of champions in order to become a champion of RuneScape yourself. After defeating him you shall be a champion... Congratulations! You may notice there are other champions around the arena, but fights against them have not yet been introduced by Jagex. When you defeat the champion of champions, you will also receive his seat as Human champion.